I just returned from my second annual yoga retreat to the Pacific Coast of Mexico just south of Zihuatenejo. Last year, I heard about the option to attend a traditional Mexican sweat lodge ceremony or “Temazcal” with a local “curandera” or healer. 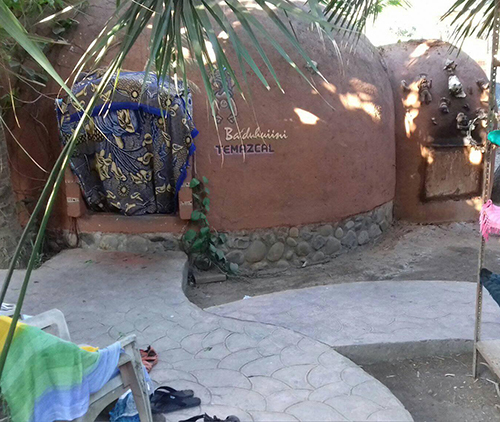 Naturally, I organized a private optional “Temazcal” for those who wanted to join me this year. We had a total of eight intrepid yogis who headed out Thursday afternoon to meet Lupita, a Mexican woman whose ancestors have been leading these ceremonies for thousands of years. Lupita told us that the colonizers would break the legs of her people so that they couldn’t dance, but they would still sing using their voices to express their truth. Lupita led us in her native five directions ceremony using Nahuatl names for each of the cardinal directions and calling in PachaMama as the fifth. We all knelt and put our hands on the Earth in that moment in gratitude for all of her gifts, we – her children – bowing our heads in reverence. The natives of the area we were in are known for the mats they weave from a local palm, and Lupita shared the symbolism of the craft. These woven palm mats are like individuals woven together in community: we are much stronger when we stand together. Basically, everything this woman said had so much resonance to me it was like a neon blinking sign “PAY ATTENTION” of how much we as a country have strayed as well as the vital importance of standing together now. My heart felt full, open and broken all at once, and I had tears flowing down my face as I attempted to translate all this amazing woman was saying to my group. It was just so very poignant in this time, when our country is reeling; and everything this woman was telling us resonated a thousandfold. It literally brought me to my knees. Over the next three hours, we were held by this woman we had just met; I mean literally held – she hugged us, sucked toxins out of our heads, held us and bathed us. Lupita embodied Mother Earth; and we became her children. The sweat lodge itself is like a big clay oven that symbolizes the womb, and we went inside to sweat out toxins and shed our old selvess and to be birthed and emerge new, cleansed, having let go of the past. I encourage you to join me soon for a yoga class where you can move, breathe, and feel your feet on the Earth. In our modern day Northern California “sweat lodge” – I will always teach and hold space for you to shed unwanted layers, reconnect with your heart, and align with the strength we have as a community. Stay strong dear ones!